I believe this is more of a process issue (user error). Anyway, let's see if I can explain it. 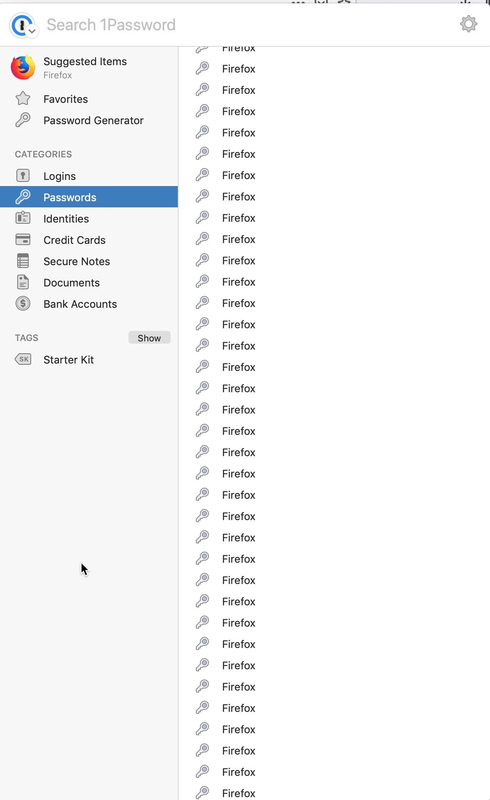 Using Firefox Quantum on Mojave, I find a password I want to change. 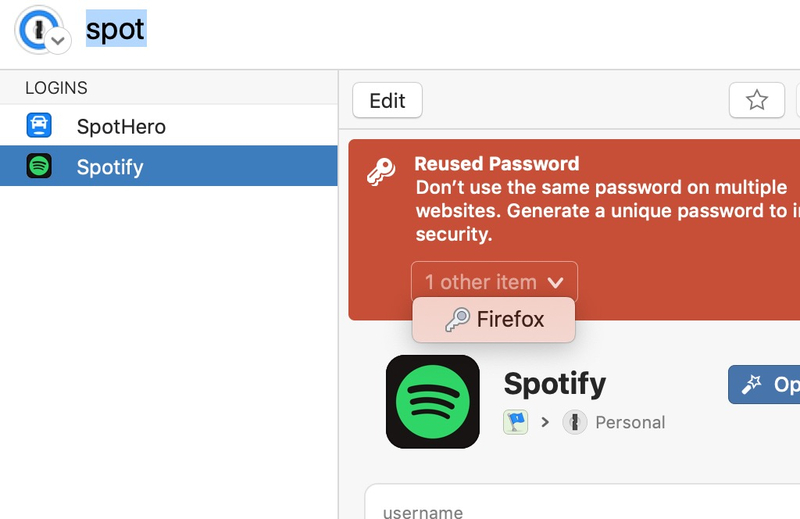 I open 1Password (not the extension) and generate a new password. I copy and I paste it into whatever site I'm on. Everything's great. But when I open either 1Password or the extension, I now get this error. Not a big deal, I know it's not "reused". But it bugs me! Any help appreciated. @boberonicus: Hmm. Did you maybe generate that password while Firefox had focus but you had no website open there? Happens to me a lot when I'm messing around with the password generator. If you then used that password to save in a Login, then you'd have both a Login item and the (automatically saved safety net) Password item matching it. You probably don't need both. Did you maybe generate that password while Firefox had focus but you had no website open there? That is quite possible. I think we're getting close. Looking at my "password category" I have a whole bunch of the entries below. I'd love to read a "best practices" document for the day-to-day use of 1Password, which might help. I'm often unsure if I should start by creating the login item for the existing weak password, start by telling the website I've "forgetten" the weak password, create the 1Password entry only after the fabulous password is in use, etc. @boberonicus - I'm not sure how much this differs from what you were doing, but we've got a guide to changing your passwords that might interest you. Let me know if you have any questions about it. @boberonicus: Ha! Thank you! Indeed, that's pretty much what mine looks like too, except I've got a fair mix of "Chrome" and "Safari" as well. I tend to jump around, and also generate a ton of passwords testing various things. I can now create this "reused password" problem pretty crisply. Edit the 1Password entry to get the new password in place. @boberonicus - that's the problem we were discussing back in January -- you are using either 1Password mini to generate the password, but you don't have the browser extension installed (since you have 1Password X installed instead), so 1Password can't determine anything besides the fact that you have Firefox as your front-most application. 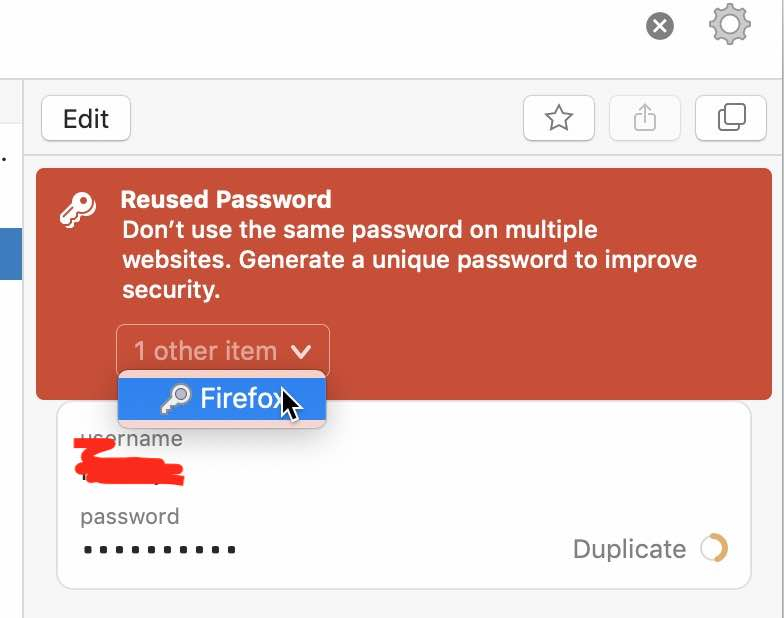 Hence "Firefox" as the password name...because that's all the information 1Password mini "knows." In order for it to be able to interface with the browser and the actual contents of the page in question, you'd need to have the 1Password extension (desktop app required) installed, not 1Password X. The other way to do it would be to use 1Password X to generate the password, not the mini from your Mac's menubar.